On July 11, 1433, Fra Angelico received the only monumental public commission of his career for an entity other than a church, monastery, or chapel. 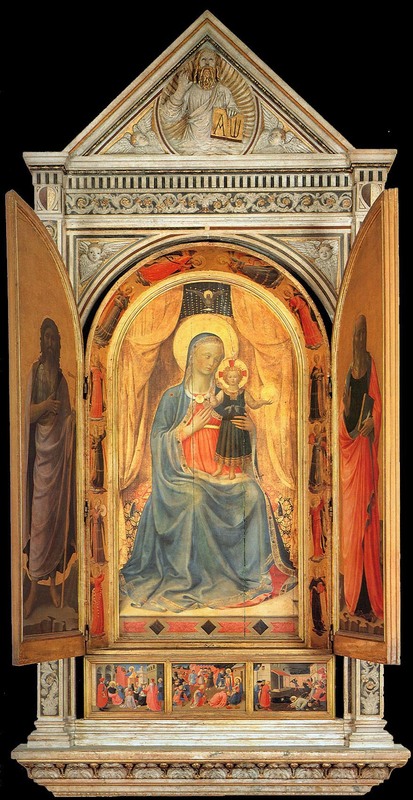 He was engaged to paint "inside and out, with the finest colors, gold, blue, and silver that can be found,"(*1) a tabernacle triptych for the guild hall of the Arte dei Linaiuoli. Apparently, the tabernacle was to replace an earlier image of the Virgin, of the colossal type known from surviving examples dating from the end of the thirteenth or the beginning of the fourteenth century by artists such as Cimabue, Duccio, Lippo di Benivieni, and Bernardo Daddi. Planning began at least as early as the middle of the preceding year: on October 29, 1432, the massive panel supports that comprise the tabernacle, based on a construction design of surprising complexity provided by Lorenzo Ghiberti, were commissioned from the woodworker Jacopo di Piero, called il Papero. (*2) Once these were delivered to Angelico for painting, work commenced on the carving of the marble frame to house the painting, again according to a design by Ghiberti, which, in turn, was commissioned on August 11, 1433. (*3) No unequivocal documentation survives of the project's completion, although a notice of August 6, 1436, recording payment for painting, brickwork, and glazing "allato al tabernacolo" ("alongside the tabernacle") is generally assumed to imply that the work was finished and installed. (*4) It may be safe to claim that these costs were part of, or occasioned by, the installation of the marble tabernacle frame, since, among other items, the document specifies payment for bricks, mortar, stone, and ironwork "per murare in decto tabernacolo" ("for walling in the said tabernacle"), but it reads as a summary of various accounts already disbursed, which had begun at least as early as November 23, 5435, with the reimbursement to a certain Piero di Lorenzo for painting "around the tabernacle. "(*5) Furthermore, Angelico's work was entirely independent of the carving or installation of the marble frame, and could have been completed at any time either before or after 1435/36. The main panel of the Linaiuoli tabernacle contains an image of the Virgin and Child Enthroned (fig. 83), conceived on a scale that dwarfs all but the largest of Angelico's monumental fresco commissions. Above the Virgin's halo hovers the dove of the Holy Spirit against a painted blue vaulting with gold stars, and at either side of her are heavy gold draperies depicted as though pulled open and pinned to the painting's frame — a projecting molding similar to the one that surrounds the Parma Virgin of Humility (cat. 21 A). The twelve music-making angels painted on the frame have become icons in the popular imagination: a seemingly inexhaustible supply of painted or photomechanical reproductions of them have been sold as souvenirs in Florence from the nineteenth century on. 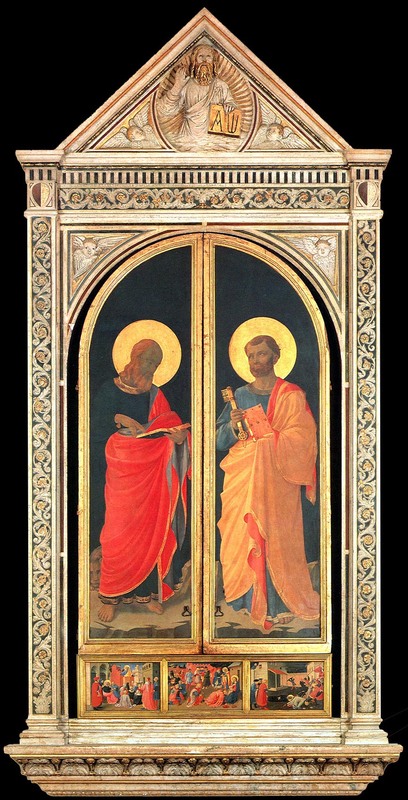 Affixed to the outer edge of this frame are large (290 x 88.5 centimeters) folding wings that close over the center panel; on their inner surfaces are over-life-size painted figures of Saints John the Baptist (left) and John the Evangelist (right) and on the outer surfaces, visible when the wings are closed (fig. 84), are images of Saints Mark (left) and Peter (right). Below the tabernacle, but still set within Ghiberti's marble frame, are three predella panels, which represent the Adoration of the Magi (fig. 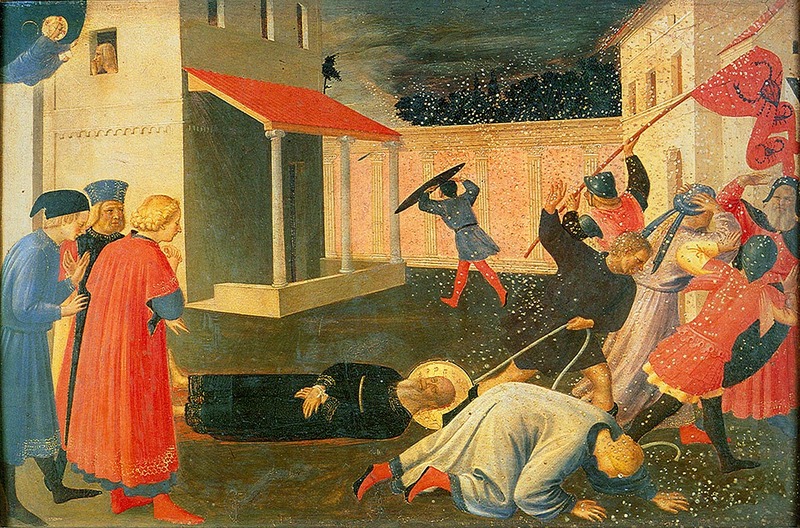 85) in the center; on the right the martyrdom of Saint Mark (patron saint of the Arte dei Linaiuoli), whose body is being dragged through the streets of Alexandria in a hailstorm (fig. 86); and on the left Saint Peter dictating the Gospel of Saint Mark — the present work. A passage in Ghiberti's Commentari, in which he boasts of having assisted painters in depicting figures enlarged "fuori de la naturale forma" ("beyond their natural size"),(*6) coupled with our knowledge of his involvement in designing the frame and support structure for the Linaiuoli tabernacle have led to widespread speculation on the likelihood of his direct intervention in the ideation of Angelico's paintings for the tabernacle as well. Certainly, the monumental painting of Saint Mark on the exterior wing of the tabernacle bears no relationship to Donatello's marble standing figure of the saint (1411-13) in the niche of the Linaiuoli on the facade of Or San Michele, but there is no reason to assume that it therefore is a reflection of a model by Ghiberti rather than an invention by Angelico himself. To be sure, Angelico's early figure style and compositional methods owe a substantial debt to Ghiberti's example, but by 1433 the Dominican master was firmly established — and, indeed, unchallenged — as the most accomplished painter in Florence, and there is nothing about the large figures in the Linaiuoli tabernacle, either in their overall conception or in specific details, that is incompatible with the course of his artistic development at this date. The same is true of the three predella scenes, although they — and the central Adoration of the Magi especially — do reveal in their execution the hand of an assistant first discernible in the predella to the Cortona Annunciation altarpiece of about 1430-31. 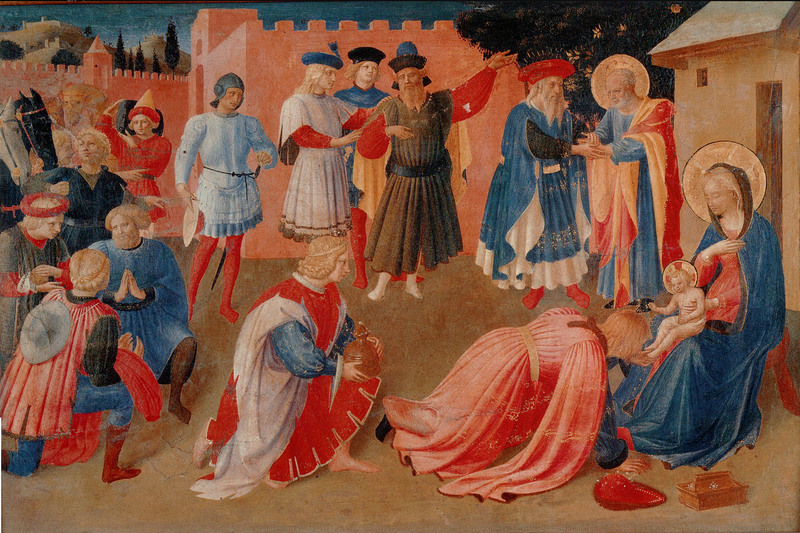 This assistant's intervention in paintings by Angelico appears to have been sporadic rather than continuous, and with varying degrees of responsibility, ranging from the insertion of minor details into larger compositions to the virtually complete execution of the master's designs, functioning as Angelico's amanuensis. Given the chronology of his work for Angelico (from about 1430 to perhaps the mid- 1440s) and its irregularity, it would seem that he was not a traditional apprentice or journeyman assistant as much as an occasional collaborator. There is also reason to believe, on the basis of style and of the incidentals of his biography, that this assistant can be identified as Zanobi Strozzi (see pp. 228-30). 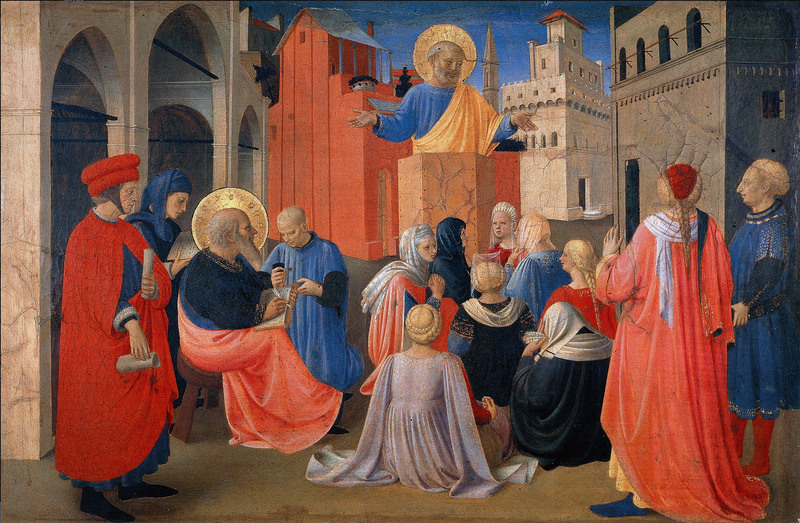 If Zanobi Strozzi's intervention can be detected in the panel of the Saint Peter Preaching, it would be limited to some mechanical details of the background. Yet, even in these passages — if they are, indeed, by him — he must have been scrupulously following a detailed drawing by Fra Angelico, for the organization of space and the staging of the narrative is masterful. (*7) The naturalism of the figure of Saint Mark, seated on a three-legged stool with his legs crossed, taking dictation, and of the page kneeling behind him holding an inkwell, is entirely in keeping with that of the predella to the Saint Lucy altarpiece (cat. 25) or the Louvre Coronation of the Virgin altarpiece. Yet, such details as the braid wrapped carefully around the head of the seated woman seen from behind, in the foreground of the composition; the gauzy headdress of the seated woman in front of her and slightly to the right; and the painstakingly rendered nailheads in Saint Peter's pulpit or in the heavy wooden door behind him to the left betray an intimate awareness of the minutiae of everyday existence that informs all of Angelico's work but not that of any other Florentine artist prior to the emergence of Francesco Pesellino in the middle years of the century (see pp. 269-89). (*1). Archivio di Stato, Florence, Arte dei Rigattieri, Linaiuoli, e Sarti, N. 20, Campione dei debitori e creditori, 1418-1511, fol. 98v. (July 11, 1433). First published in Baldinucci 1768, pp. 91-92. (*2). Ibid., sub datum. First published in Gualandi 1843, p. 109.This entry in the account books of the Arte records the commission to Jacopo di Piero "a fare el legname del tabernacolo grande di detta arte, dove oggi a dipinta la figura di Nostra Donna, avendo fattone fare de tutto uno modello per mano di Lorenzo di bartoluccio." This work is sometimes said to have involved executing a wooden model of the tabernacle frame, but it is clear that Ghiberti had already made and been paid for such a model. The reference to "la figura di Nostra Donna" suggests that this tabernacle was designed to replace an existing image, undoubtedly explaining its unusual and archaic type and scale. (*4). Ibid., fol. 99r., sub datum; Cole 1977, vol. II, p. 596. (*5). Baldinucci 1768, sub datum; Cole 1977, vol. II, p. 595. (*6). Commentari II, vi, I:"Etiandio chi avesse avute a ffare figure grandi, fuori de la naturale forma, dato le regole a condurle con perfetta misura"; published in Ghiberti 1998 ed., p. 97. (*7). A replica of this scene that appeared consecutively in the sales of the Bournenville (Hotel Drouot, Paris, May 21-22, 1883, lot 127), Aynard (Galerie Georges Petit, Paris, December 1-4, 1913, lot 36), and Spiridon (Muller, Amsterdam, June 19, 1928,1ot 15) collections seems to be modern.